Attendees at the fête included Guillaume Apollinaire, Jean Metzinger, Juan Gris, Marie Laurencin, art critic André Salmon, art dealer and historian Daniel-Henri Kahnweiler and the collectors Leo and Gertrude Stein. Many of them were also fascinated by so-called “primitive” art, discovering in it a powerful form of emotional expression that felt modern. For them, Rousseau became a sort of home-grown primitive whose paintings captured something of the abstract verve they admired in African art. For example, Wassily Kandinsky, who in 1912 included African artifacts in the Der Blaue Reiter Almanach, acquired two of Rousseau’s paintings, commenting that Le Douanier opened the way to the possibilities of simplicity in art. These zippy avant-gardists praised Rousseau’s style of innocence based, they presumed, on his inner conviction of the rightness of his private vision. In The Douanier Rousseau: Archaic Candour at the Musée d’Orsay, curators Beatrice Avanzi and Claire Bernardi pick up on this relationship with modernism and go deeper into art history, comparing and contrasting Rousseau’s paintings with earlier academic ones, like Adolphe William Bouguereau’s “Equality before Death” (1848). Of the show’s 78 paintings, 45 are by Rousseau. His more mysterious works, like “The Snake Charmer” (1907), stand up well to the comparison. For me, they produced an obscure empathy that evoked the profound mysteries of natural Transcendentalism. In a sense, this show became a tale of two Rousseaus: Henri and Jean-Jacques. 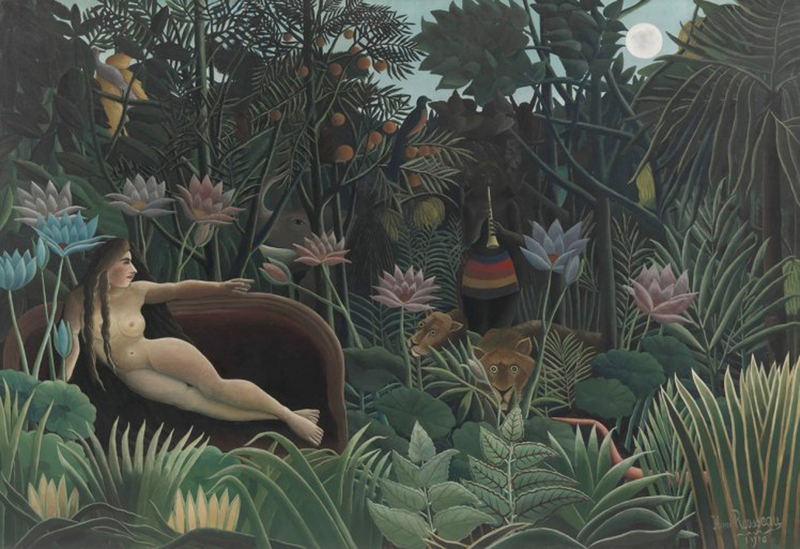 The philosopher Jean-Jacques Rousseau doubted the validity of previously socially constructed form, and, like Henri Rousseau did more than a century later, looked for answers within. Discovering and remaining true to one’s own nature was the primary aspiration for both Rousseaus. That said, Henri’s true nature is a bit of a caprice. Though he very often painted the foliage of the jungle, he never visited one. Rather, he went to the botanical garden in Paris and studied the plants and zoo animals there. And instead of painting the plants to scale, he would make them bigger than in reality, so that they came to resemble a drug-fueled fantasy world. Delaunay, his wife, Mondieur Queval and I. At the Musée d’Orsay, Rousseau’s masterpieces from the museum’s collection, the Musée de l’Orangerie, and elsewhere are displayed alongside paintings by Georges Seurat, Carlo Carrà, Diego Rivera, Max Ernst, Delaunay, Kandinsky, Picasso, and other lesser-known artists, such as the Nabis painter Félix Vallotton. Paul Gauguin’s “Schuffenecker’s Studio” (1889) is a particularly beautiful companion to Rousseau’s paintings for its flattened picture plane. Being together in the depths of an imaginary jungle is a central motif of the show, especially in the encounter between contemporary works and Le Douanier’s paintings. That is where a collective elaboration of meaning is to be found, in the symbolic and material versions of naiveté. 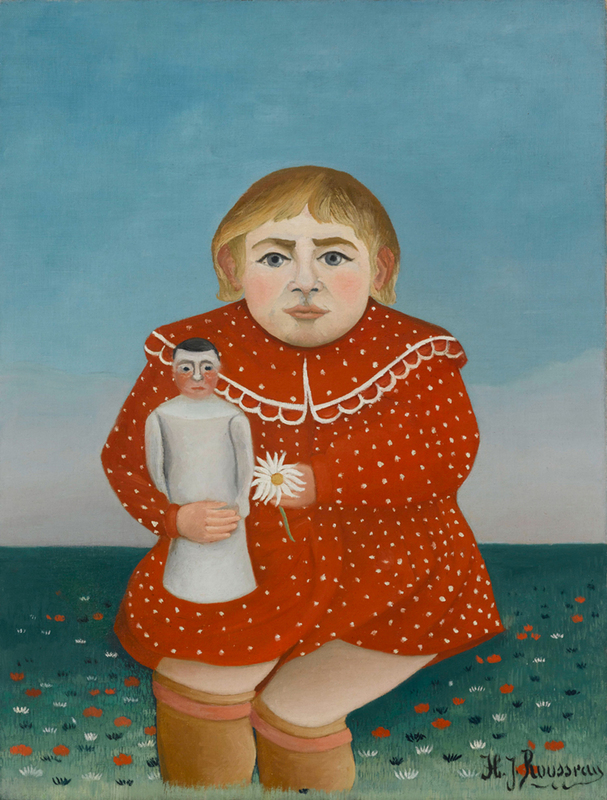 Over and above their naïve nature as semantic value, some of Rousseau’s paintings — like “Child with Doll” (1904–05) — display a strange form of folk art amateurishness. Granted, these terms have deep pitfalls. On closer look, “Child with Doll” gets weirder and weirder. It is not just the crippled-like legs of the child with a five o’clock shadow, but the way s/he is holding the doll by its crotch. Zoom in on the face of the apparently male doll in a dress, and the heavily blushing, worried look appears ominous. This painting might just as well remind you of a Henry Darger as a Gauguin. Regardless, Rousseau was the first naïve painter to receive serious critical recognition, and he remains regarded as a great master. At first, his fresh and direct vision appealed mainly to artists, but a number of major group exhibitions in the 1920s and ‘30s helped to develop the public taste for his work — most notably Masters of Popular Painting: Modern Primitives of Europe and America at the Museum of Modern Art in 1938. 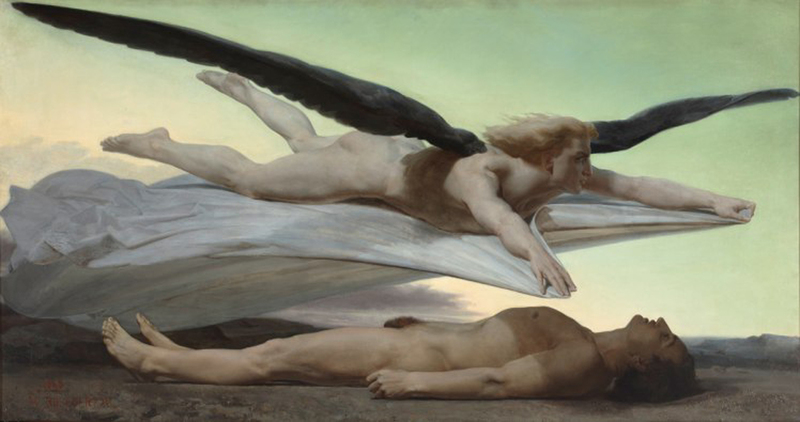 That show included perhaps the best know of his paintings, the Symbolist composition “War” (or “The Ride of Discord,” circa 1894). The painting depicts a woman-at-arms sitting sidesaddle on a pin-headed horse (or perhaps running next to it). Horse and rider are both floating — suspended in time and gravity — over a pile of corpses being picked over by a flock of black birds. As with “Child with Doll,” “War” rewards slow looking with uncanny creepiness. There are bent and twisted arms and legs to be relished, along with the beautiful, dark, twisted fantasies found in the left eye of a doomed man staring out at us. That despondent eye is matched with another left eye, closed and enclosed in a triangle at the figure’s crotch, with a small but lethal bullet hole above it. The pink sunset colors of the clouds and warm yellow backdrop give this flat painting an attractive, if ghastly, splendor. It is surprisingly placed next to Paolo Uccello’s Goth “Saint George and Dragon” (c. 1470), for no apparent reason that I could grasp, other than they looked cool together. At the end of 19th century, Europe had developed a fascination for the exotic due to the expansion of and spoils from colonialism, but with Rousseau’s “The Hungry Lion Attacking an Antelope” (1898/1905) we are far from the trouble-free jungle that Jean-Jacques Rousseau considered the natural state of happiness. Even people like Le Douanier, who never left France, couldn’t buy into that delusion for long. 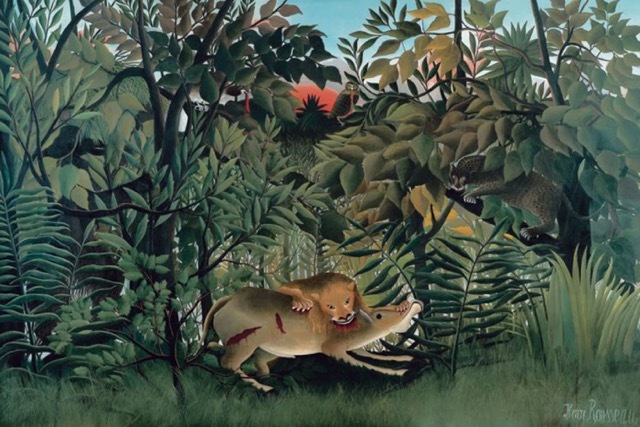 Rousseau transmuted to canvas all sorts of hairy, gruesome activities in his fake jungle, which eventually spanned 25 paintings, including “Tiger in a Tropical Storm” (1891) and the unlikely masterpiece “The Dream” (1910). This and other late works received short shrift from critics at the time, no doubt partly because Rousseau was seen as a toll collector who dreamed of being a painter. This exhibition fulfills Rousseau’s dream handsomely by placing him within a wide art historical context that connects his paintings to as far back as the 15th century, as demonstrated by the inclusion of the wonderful tempera painting “Portrait of an Unknown Man with a Red Beret” (1493) by Vittore Carpaccio from the Museo Correr in Venice. This work would, in turn, influence several generations of artists, including Fernand Léger, who took inspiration for his “The Mechanic” (1920, also included in the exhibition) from Le Douanier’s “Portrait de Pierre Loti” (1891), which was based on the Carpaccio. Here, Le Douanier’s paintings merge into an archaic stylistic jungle that can be described as anti-classical, standing in contrast to the “official” painting style — of his time, or any time. The show closes, fittingly, with a series of his invented jungle scenes inspired by the flora of Parisian public gardens, places where dawdlers go to daydream and escape banal daily realities. 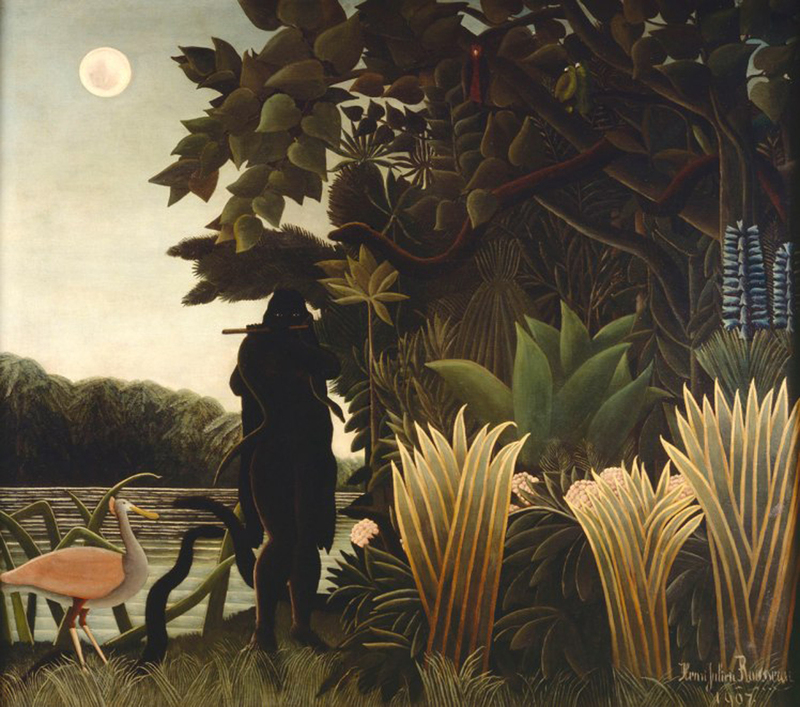 Rousseau’s awkward pipe dream paintings remind us that art is one manifestation of the broader human capacity to consciously reshape our image through deliberate whimsy — if only in order to explore our own capacity to do so. 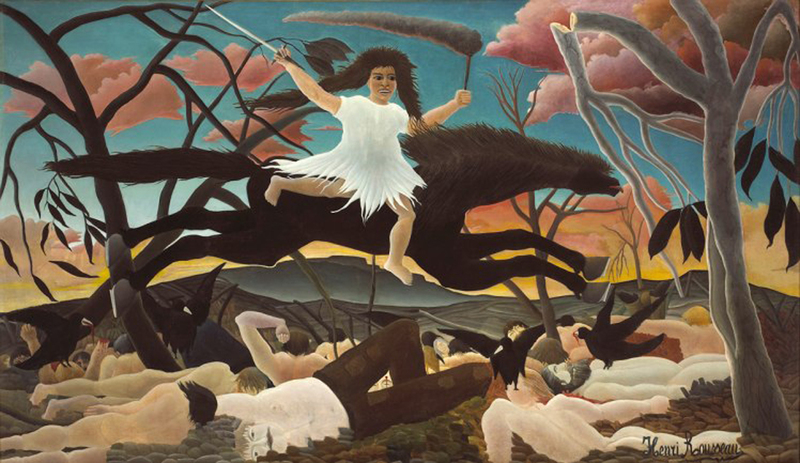 The Douanier Rousseau: Archaic Candour continues at the Musée d’Orsay (1 Rue de la Légion d’Honneur, 7th arrondissement, Paris) through July 17.